Looking for a USED SEO/27-CVE-CS? Years of experience have led our Technical Department to define two families of machines. 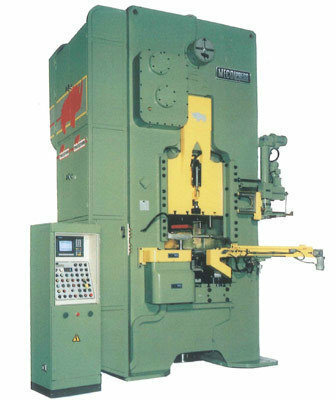 SOV presses, with direct drive, are forging machines suitable for pressing parts requiring vertical extrusion. SEO presses, working with a discontinuous cycle, have a long stroke of the ram and are suitable for forging through GE sub-press for horizontal extrusion, while SEO/*F presses are very powerful forging machines with high rigidity, suitable for both deep vertical extrusion and horizontal extrusion. SEO presses are also available in high productivity SEO/*-CVE-CS models. These machines make it possible to change the number of strokes per minute and consequently the number of pieces produced per minute. In addition they can be run in intermittent or continuous mode. Mecolpress was established 1n 1969 with the aim of manufacturing presses for the hot forging of metallic alloys. The design know-how of the founders and the continuous research for technological innovations allowed the company to gain in a short time a leading position among the manufacturers in this specific field and to gain an excellent reputation all over the world. In the beginning all efforts were directed towards to the hot forging of brass components, with standard presses up to 8000kN and with special presses up to up to 10000kN and more. Today our presses can be used for hot forging of steel, copper, aluminum, and different other alloys. 67 ModelsView more about Mecolpress S.p.A. Looking to Purchase a New MECOLPRESS SEO/27-CVE-CS? Consorcio Eurocon, S.A. de C.V.